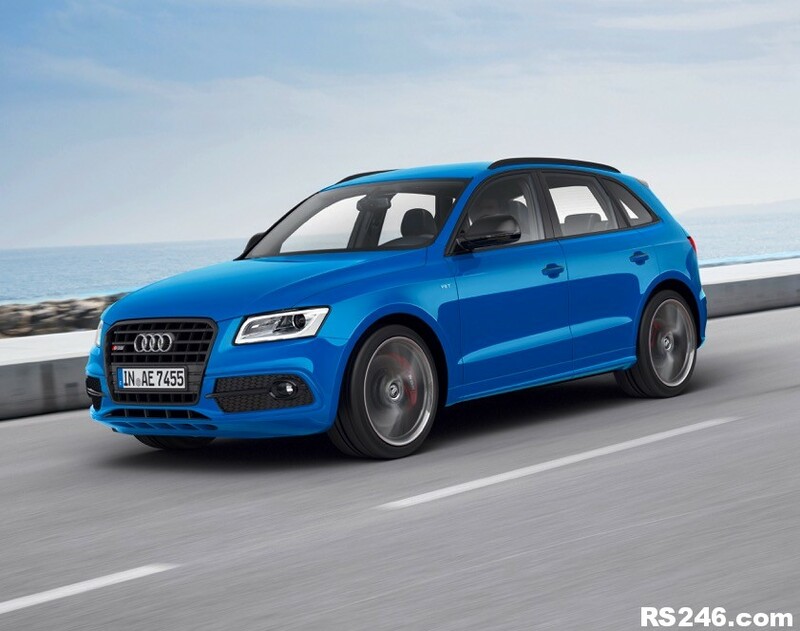 The already formidable Audi SQ5 TDI reinforces its status as a practical SUV delivering genuine sportscar pace this week as it becomes the latest Audi ‘S’ model to undergo the performance-intensifying ‘plus’ treatment. 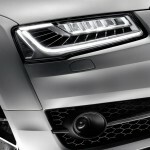 With more power, more torque and more equipment than its ‘standard’ counterpart, which is notable as the first ever diesel-powered Audi S model and remains in the line-up, the new SQ5 TDI plus will be available to order later this year. UK pricing will be also be confirmed at a later date. The biturbo V6 TDI at the heart of the SQ5 TDI plus produces 340 PS from its three litres of displacement by way of increased injection pressure. 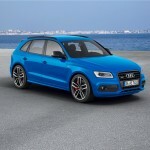 This results in 27 PS more power compared to the current SQ5 TDI. Its peak torque is increased by 50 Nm (36.9 lb-ft) to 700 Nm (516.3 lb-ft), enabling acceleration from rest to 62 mph in a mere 5.1 seconds; top speed is electronically limited at 155 mph. According to the NEDC combined cycle consumption test, up to 42.8mpg is also potentially achievable with emissions of 174 g CO2/km, which along with the plentiful torque serves as just about the only reminder that this performance flagship prefers diesel. 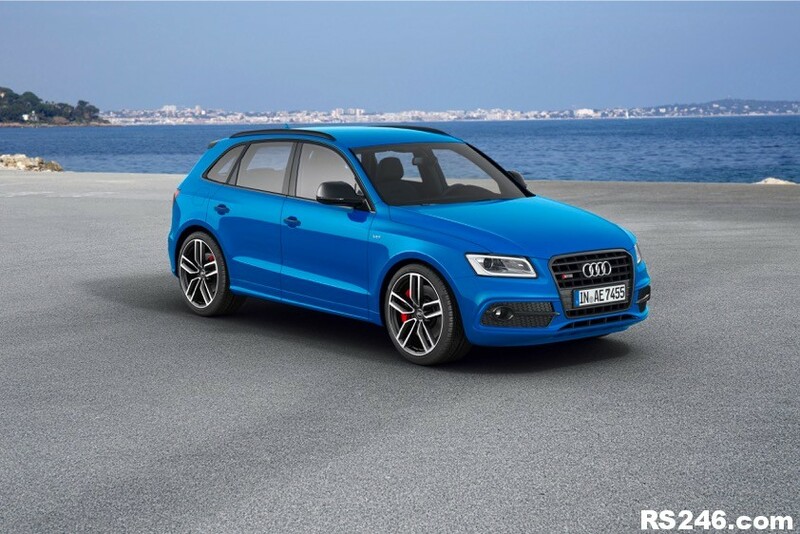 Like all S models from Audi, the SQ5 TDI plus delivers its power to the road via the quattro permanent all-wheel drive system. For the first time on a Q5 variant, a sports differential at the rear axle actively distributes the drive power between the wheels. 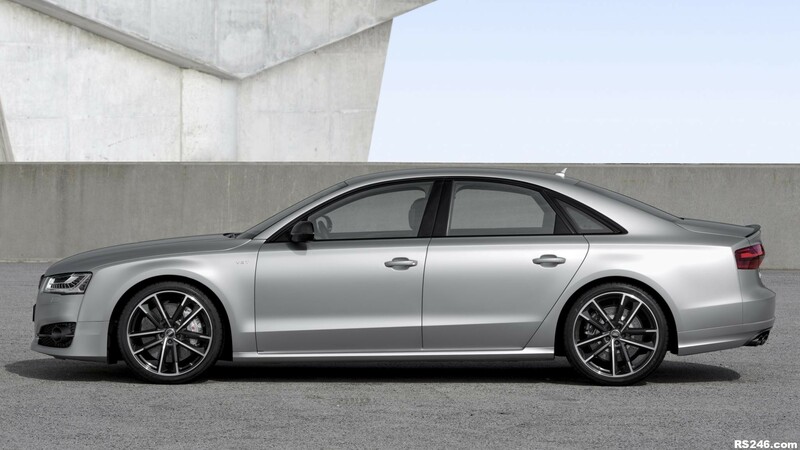 More immediately noticeable clues to the plus version’s status can be found externally, where its rank is conveyed by gloss black 21-inch cast aluminium Audi Sport wheels in 5-twin-spoke star design and an extended black gloss package taking in the exterior mirror housings, door handles, roof edge spoiler and rear diffuser. 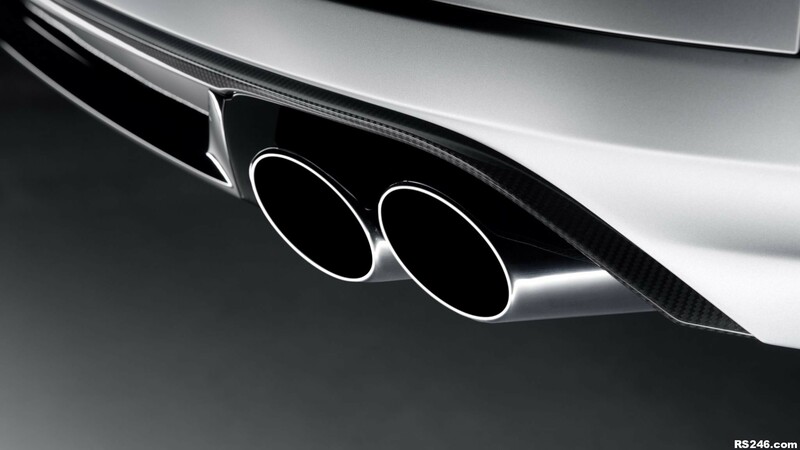 A further visual customisation feature on the exterior are two clasps that join the four exhaust tailpipes in pairs. 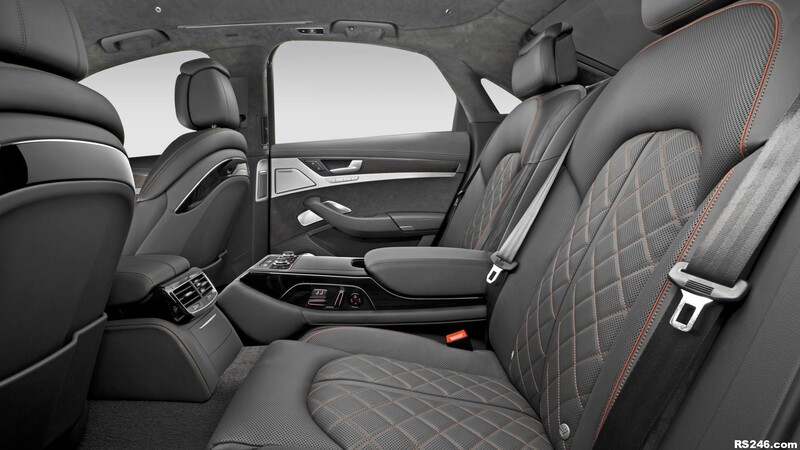 Inside, diamond stitched fine Nappa leather upholstery further enhances the SQ5 sports seats in the plus version, and the sliding rear bench seat plus also features as standard to increase variability and enlarge the luggage compartment, if necessary. 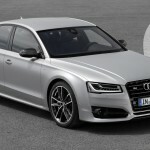 Supercar pace and archetypal Audi A8 luxury converge in the Audi S8 plus, a new evolution of the already formidable S8 performance saloon developed using the combined expertise of Audi and its specialist high performance division quattro GmbH. 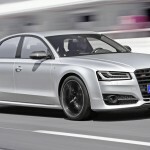 Ramping up power from the 520PS offered by the ‘standard’ S8 to an intoxicating 605PS, the S8 plus is also capable of producing up to 750Nm of torque on demand – the highest output of any Audi in the current model range. It will open for ordering in October, priced from £97,700 OTR, and first UK deliveries are expected to commence in January 2016. 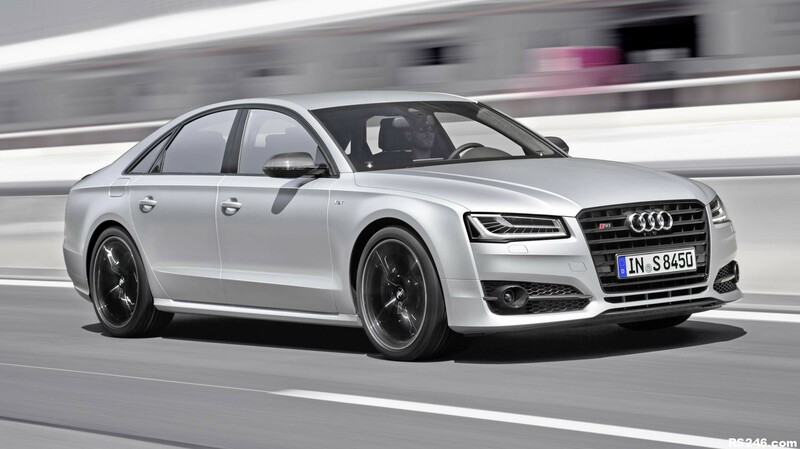 Encased by the lightweight, predominantly aluminium Audi Space Frame, which in isolation weighs just 231kg, is a modified version of the 4.0 TFSI engine already used to power the current 520PS S8. 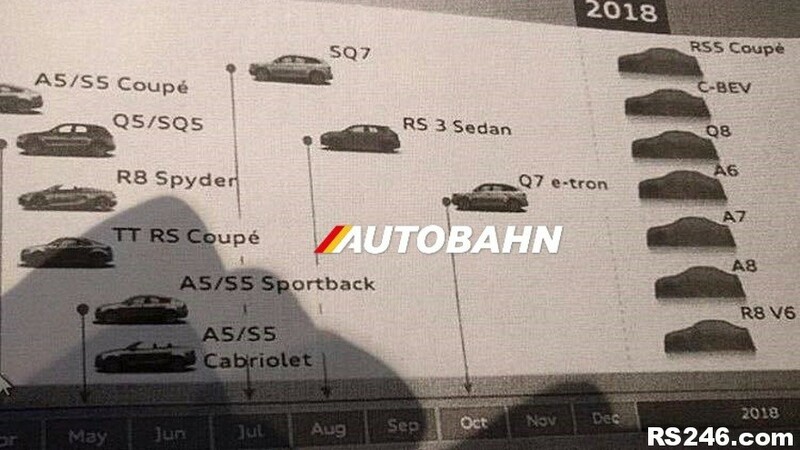 This sonorous V8 biturbo unit has been extensively modified and gains special engine management control with speed and charge pressure boosting to its modified exhaust valves. The inner geometry of the turbocharger has also been optimised for efficiency. The overboost function increases the maximum torque from 700Nm (516.3 lb‑ft) to 750Nm (553.2 lb‑ft) when required. As a result, a mere 3.8 seconds is all it takes for the stately super saloon to blast past 62 mph, after which it swiftly pulls towards an electronically limited 155mph top speed. Upon choosing the optional dynamic package, top speed increases to 189mph, and fade-resistant carbon-fibre reinforced ceramic brakes are added, featuring brake calipers finished in anthracite-grey with the Audi ceramic logo. 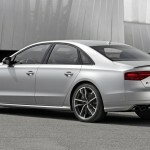 The power is delivered to the road via an eight-speed tiptronic transmission and quattro all-wheel drive. 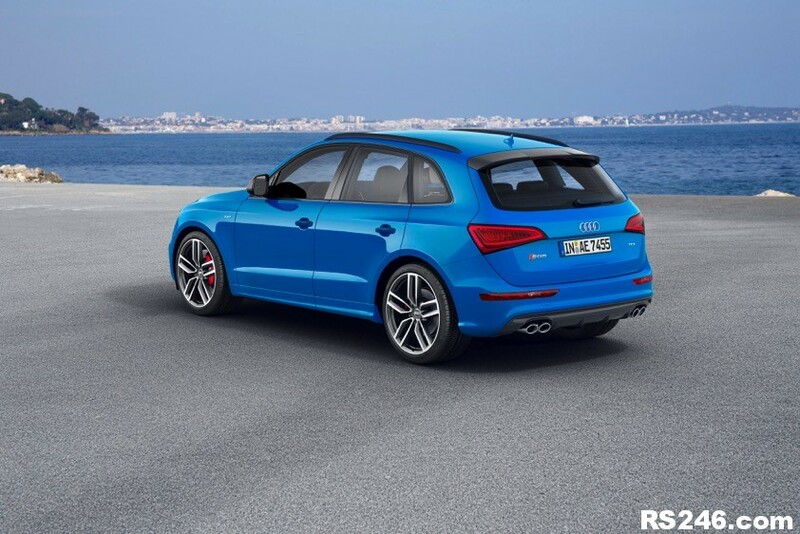 A sports differential splits the torque between the rear wheels for optimum directional stability. 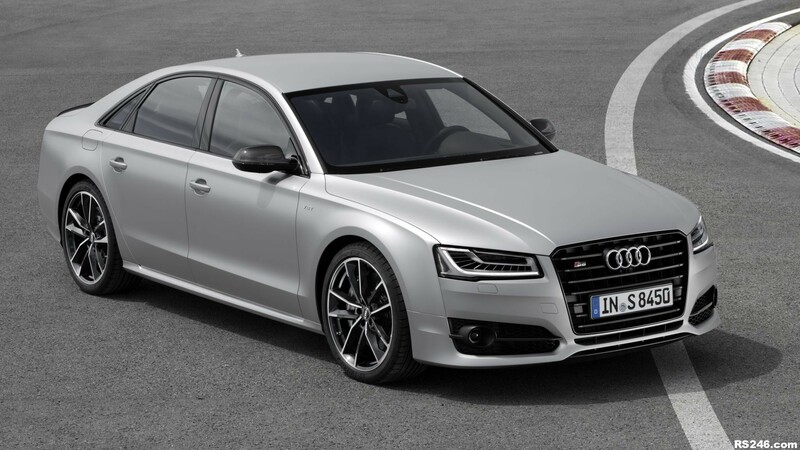 Chassis highlights include the S sports adaptive air suspension and dynamic steering, both of which have been tuned specifically for the S8 plus. UK specification models are fitted with 21‑inch alloy wheels in a unique high-gloss black double-spoke design shod with specially designed size 275/35 tyres. 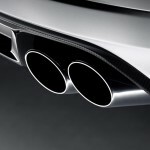 The standard dual-branch sports exhaust system opens out into two oval high-gloss black tailpipes on the left and right. 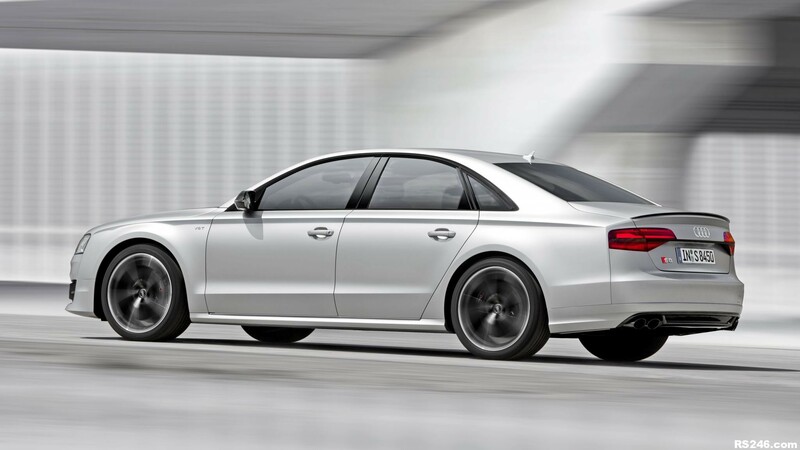 It is modified by quattro GmbH and gives the S8 plus an unmistakable V8 sound. Carbon fibre is also used on the flaps in the side air inlets and the blade on the front apron. The rear diffuser, Singleframe front grille, air inlets and window trims form part of the black styling package, as do the mirror housings. 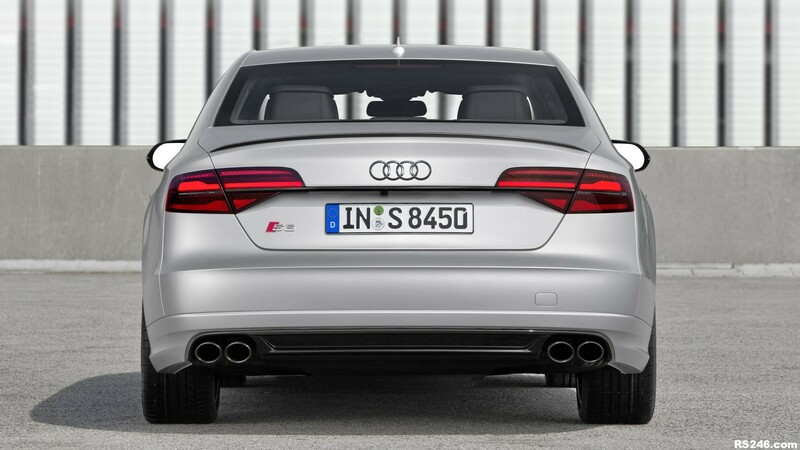 Distinctive design characteristics of the S8 plus also include darkened tail lights and a rear lip spoiler in body colour. 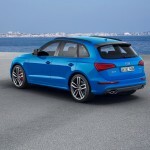 As an option, the mirror housings and rear spoiler can also be specified in carbon fibre. 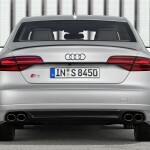 Subtle S8 logos on the front and rear with V8 T badges on the front wings. A matt-effect paint finish in floret silver is exclusively available on the S8 plus. All of the colours offered on the S8 are also offered for the S8 plus. 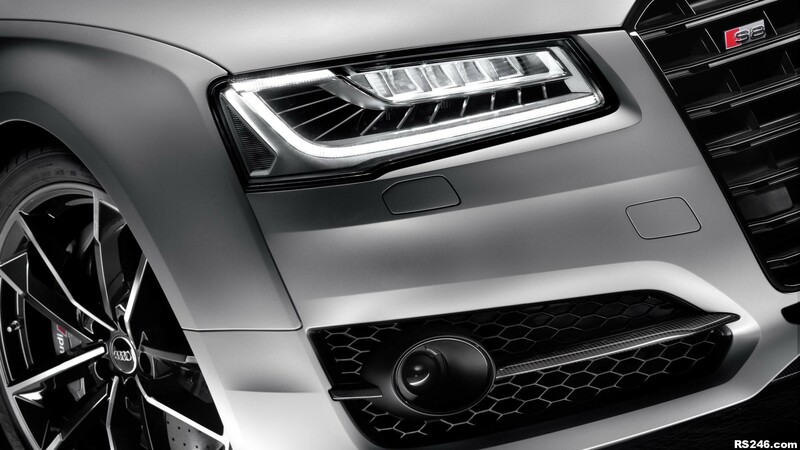 Matrix LED headlights are standard, complemented by dynamic turn signals front and rear. These state-of-the-art lights use mapping data from the MMI Navigation Plus with MMI Touch and other sensors to individually dim or illuminate the 25 small, individual LEDs as needed. Inside, the S sports comfort sport seats with 22-way adjustability and memory function can be exclusively upholstered in black full-leather with contrasting stitching and piping in Arras red as an option, along with the headlining and rear parcel shelf in black Alcantara. A contrasting red thread woven into the upper inlay can also be specified in favour of the carbon atlas inlays fitted as standard. 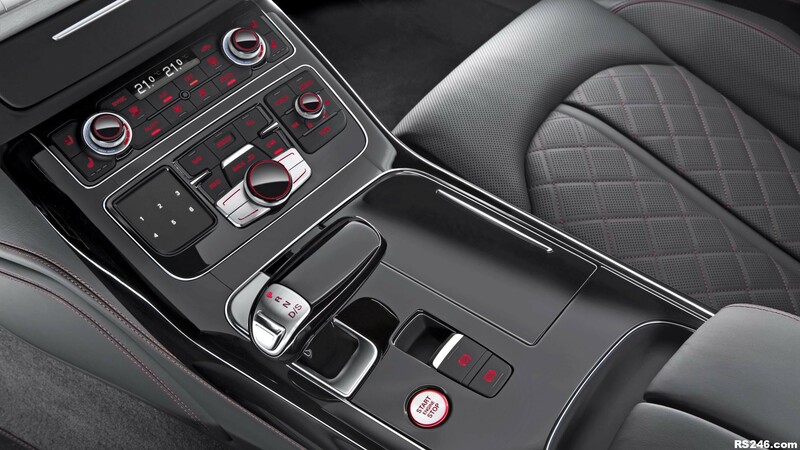 Black piano paint trims the gear selector lever of the tiptronic and the centre console. Characteristic of the interior of the S models are the round instruments with grey dials and white needles and the stainless steel pedals. 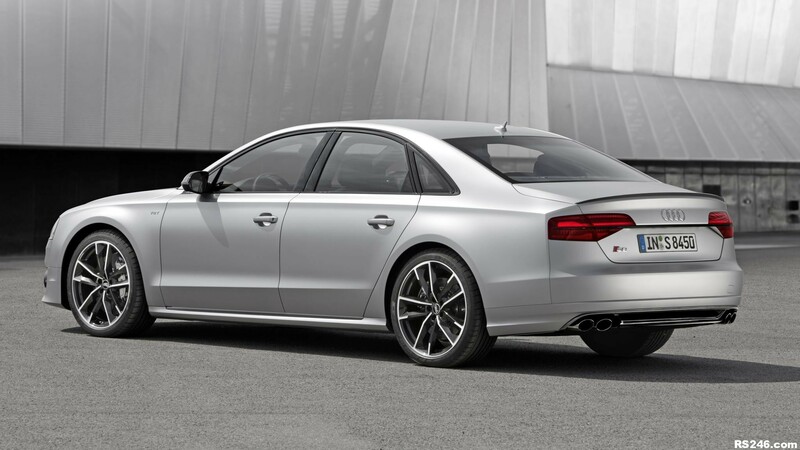 Don’t forget the power-operated hands-free boot lid, advanced key, 14-speaker BOSE surround system and advanced parking system with top view camera, the plus privacy glass, power door closure and adaptive cruise control with Audi pre-sense front.